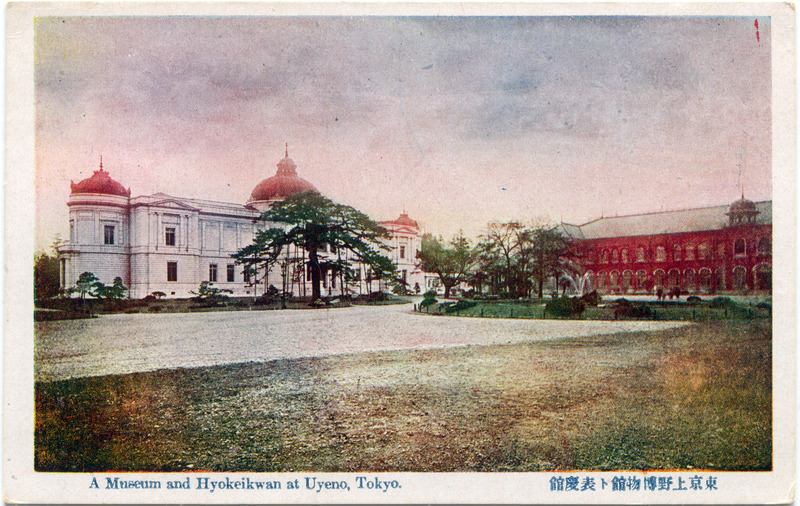 Left to right: The Hyokeikwan (Imperial Museum), opened in 1909, and the original Hakubutsukan (National Museum) at Ueno Park, opened in 1882, c. 1910. Hakubutsukan (National Museum), c. 1910, as originally designed by Tokyo-based British architect Josiah Conder. The Tokyo National Museum (Tōkyō Kokuritsu Hakubutsukan) was established in 1872, is the oldest Japanese national museum, and the largest art museum in Japan. Soon after the opening, the museum moved to Uchiyamashita-cho (present Uchisaiwai-cho), then in 1882 moved again to the Ueno Park (on the site formerly occupied by the headquarters of the Kan’ei-ji Temple), where it stands today. 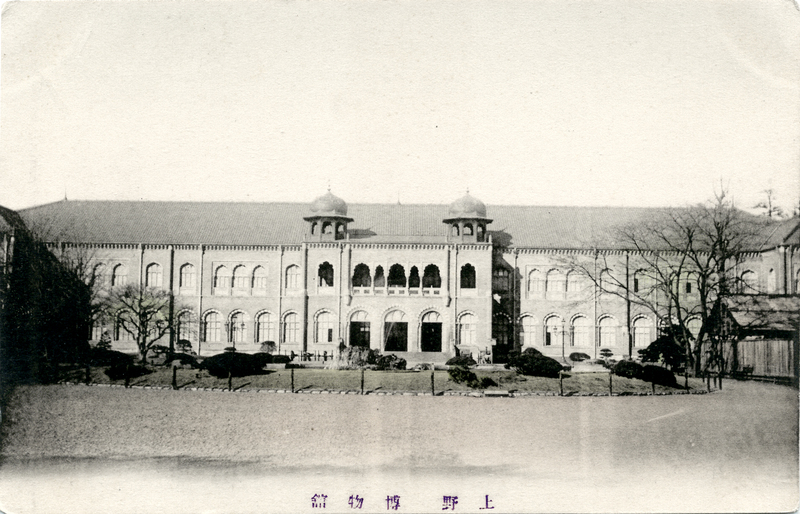 Located (along with the Hyokeikan) at the north end of Ueno Park, the original Main Gallery – designed by the British architect Josiah Conder, as seen above – was severely damaged in the Great Kanto earthquake of 1923. 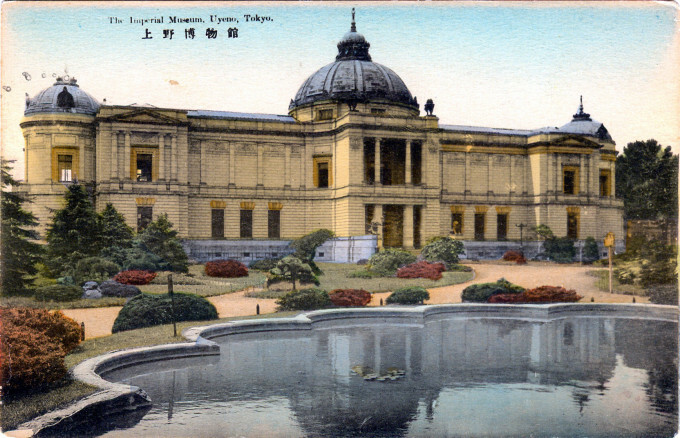 The museum went through several name changes, being first called the Imperial Museum in 1886 and, then, the Tokyo Imperial Household Museum in 1900. The present-day Honkan was constructed after the earthquake in a more Eastern ’emperor’s crown style’. 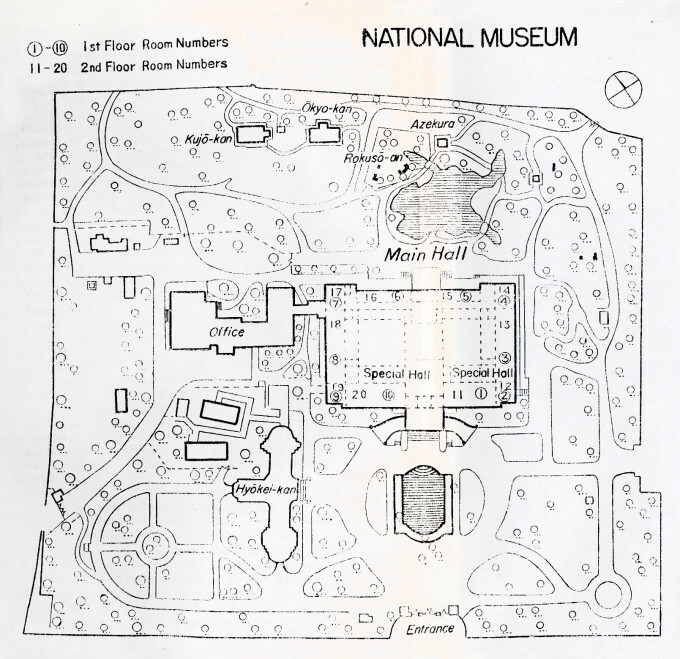 Construction began in 1932, and the building was inaugurated in 1938. The museum was closed in 1945 during the final months of World War II. 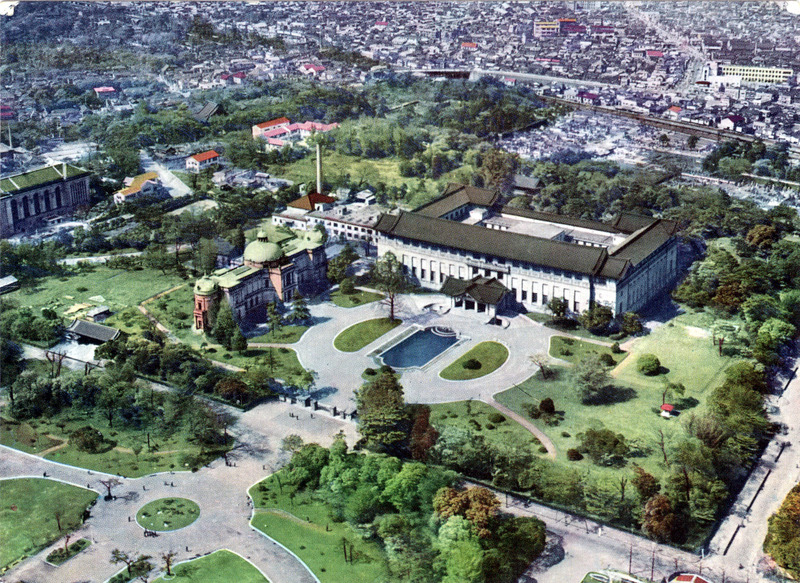 Aerial view of museums, Ueno Park, Tokyo, c. 1960. At center are the Hyokeikan (center-left) and Hakubutsukan (center-right), rebuilt in an “Eastern emperor’s crown” style after the 1923 Great Kanto earthquake. At far-left is the Tokyo Academy of Music. Built to commemorate the marriage of the then Meiji Crown Prince (later Emperor Taisho), Hyokeikan was inaugurated in 1909. 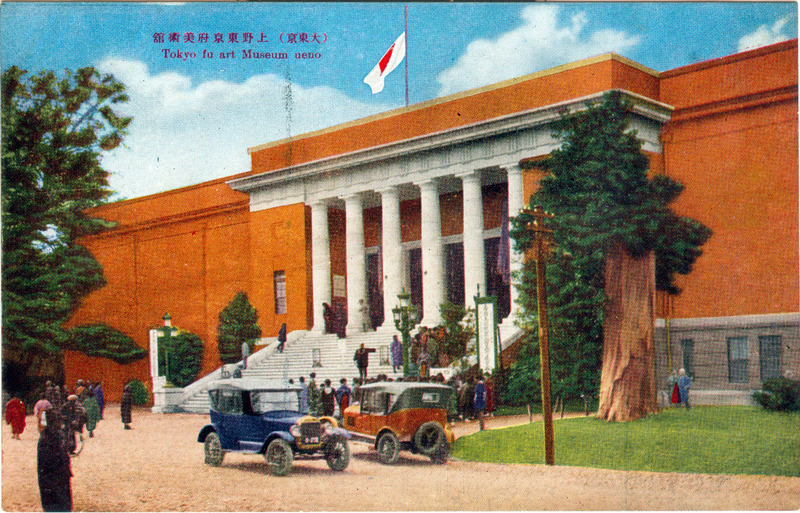 Museum of Fine Arts, Ueno Park, c. 1930. 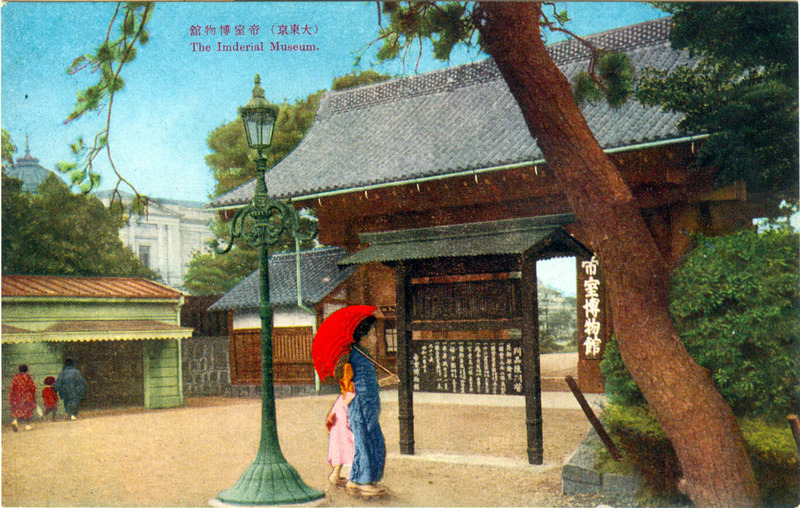 Entrance from Ueno Park to the Hakubutsukan and Hyokeikan grounds, c. 1930. 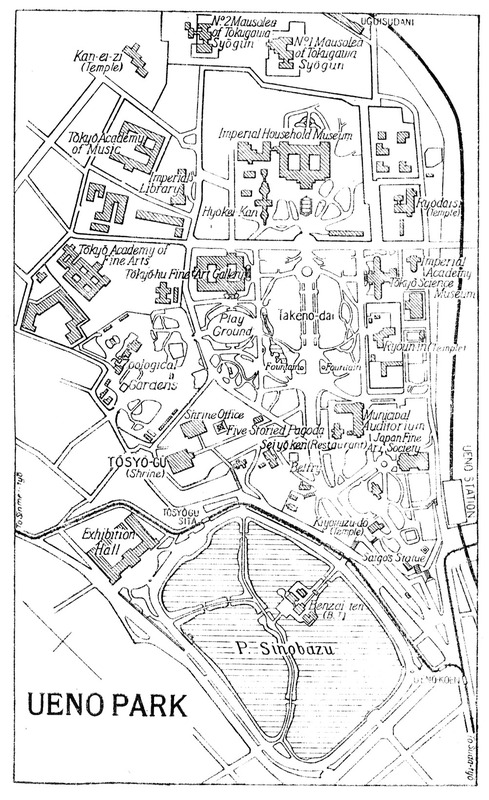 The gate was moved from the Crown Prince’s Palace (Togu Gosho) at Shiba Takanawa to Ueno Park in 1952.